Tommy Schuldner with Donald Trump, December 2015. Photo provided. 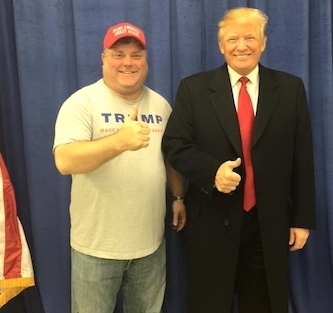 VIRGINIA – Tommy Schuldner, a Sparta NJ expat living in Virginia is the founder of The Trump Army, the largest, private member only group on Facebook in support of Presidential Candidate Donald Trump. Schuldner experienced some setbacks beginning in 2008 in both real estate and the employment markets, having to change careers several times since. 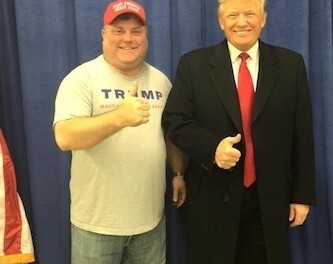 When he learned on June 16, 2015 that Donald Trump was running for President, several days later, he started The Trump Army, and immediately made all of his 500 Facebook friends members of the group. Initially, it was an action unpopular with some of his friends, who some exited the group and have since returned. Within the group’s first month, however, 1,000 members joined. Now, there are 100 requests daily from those requesting to join as members. Recently, the group surpassed the 5,500-member mark. The group’s rapid growth has not surprised Schuldner, as he has found many people are seeking in their next Presidential candidate what they see in Trump. Learning about Trump’s commitment to run for Presidency, as an entrepreneur himself, was inspiring for Schuldner. On the other hand, Schuldner has described himself as “sick and tired of the establishment,” and what he describes as the Saul Alinsky tactics that he says the Obama Administration has implemented. This includes the political correctness that he feels Trump eschews, and that Obama uses to keep America under his thumb. He said the fundamental transformation change that President Barack Obama promised for the American people was something he delivered – a promise that came with a price – and represented communism and anti-Colonialism, an over-taxation of the American people, with monies and jobs sent overseas. Schuldner sees Trump as someone who would like to return jobs and manufacturing to America, through trickle-down economics, which he says work. Trump, he said, is going to restore capitalism and pride back in the United States. He said that Trump views the American people as “exceptional,” and will bring God, Jesus and pride back to America. Schuldner also said that while individual success has been frowned on more recently in the United States, Trump embraces the spirit of individual success, and seeks it for others. Schuldner described Trump like “Reagan on steroids,” in terms of his capability to turn the United States around. “He’s going to Make America Great Again,” he said. He believes so greatly in Donald Trump’s run for President, he has even changed his license plate to “Go Trump,” which he said has only received positive feedback, people beeping their horns in support, and some asking him to pull over and take photos with Schuldner and his car. 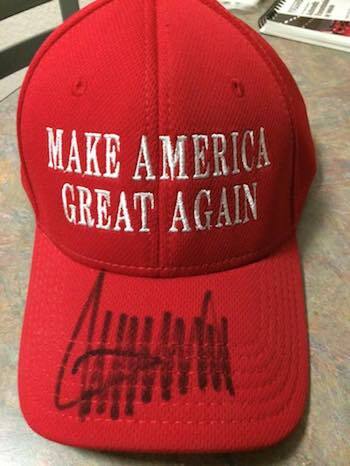 Tommy Schuldner’s hat that Donald Trump signed for him in December 2015. Image provided. He described The Trump Army like Trump himself calling the group “conservative, constitutional traditionalists.” Those are people, he says, who uphold the Constitution, while still inviting immigrants to come to the country, yet immigrants assimilate to the American Culture. He says that both can be achieved, with the Constitution allowing the free practice of the native cultures of our nation’s immigrants, while respecting those of the United States, and holding those first. “The main goal of The Trump Army is to change hearts and minds and provide information,” Schuldner said. In addition to his full-time job, Schuldner devotes about eight to 10 hours daily to the site, providing real-time news about Trump to the members. Additionally, five other administrators assist Schuldner with running the group, with more administrators being recruited soon to help. The membership has strict rules, including no attacks on other members, or inappropriate language. “If Trump himself wouldn’t post it here, we don’t allow it posted,” said Schuldner. However we are not the PC police either! Some, however, have attempted to counter the rules of the group, citing Trump’s outspokenness. Members do not usually stir up trouble, as Schuldner said they all share the common thread in supporting Trump, because of their trust in him, and the honesty that he says they see him demonstrate. “Our goal is to elect Donald Trump in 2016,” Schuldner said, noting the group contains that in its preamble, and strives to persuade Republicans, Democrats and Independents to vote for him. There are members from each of the 50 states, with about 60 percent from the Eastern seaboard, and 40 percent from the rest of the nation, with Chicago the point in the middle. The use of the term “Army” within the group name, is because “we’re going to fight for what we want,” and that is to have Trump become President of the United States. “We are not going to let the establishment, career Politicians, and media form the narrative anymore,” Schuldner added. Click here to learn about or join The Trump Army. Like what you’ve read here? Then stay on the scene with Inside Scene. Click here to follow us on Facebook as we follow the 2016 Presidential Election and other news topics. Click here to learn more about charter membership with Inside Scene and how to a part of our Wall of Fame.